There are around 200.000 semi-domesticated reindeer in Finland, most of them live and work in Lapland. Only the occasional individual ventures south like the young male called Viljo in this week’s national news. He has been spotted by motorists in southern Finland after escaping from his owner who used to live in Lapland and brought some reindeer down south with him to keep his grass short. I wonder if he’d consider a lawn mower. Let’s hope they find poor little Viljo who’s street cred is not going to last long in the foreign environs of the much more urban South of Finland and bring him home safely to his slightly bonkers owner to continue with his gardening duties. Besides gardening the career options for reindeer include tourism, pulling sleighs and being petted and obsessively photographed by Japanese tourists. Some serve in the police force. I particularly remember a female reindeer called Maija, who sadly died in the line of duty after being run over by a car. Her death was doubly unfortunate and ironic as Maija’s main job was to act as an ambassador for traffic safety. Maija’s young son Artturi will follow in his mum’s hoofsteps visiting events and spreading the important message of safe driving in the often challenging arctic conditions. Due to his heartbreaking family history his word is bound to carry some extra weight. 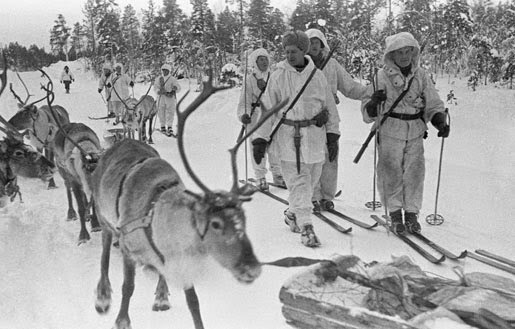 In peacetime there may not be many jobs for the reindeer in the Finnish Defence Forces, but in the Winter War 75 years ago our gentle antlered buddies fought for the freedom of our country alongside our brave men and women mainly in transportation duties. There are some professional athletes among them as well – reindeer racing may not be exactly as lucrative as the F1 and they never end up living in Monte Carlo, but the fastest and strongest reindeer and their jockeys are definite celebrities. The winners also get chosen for breeding for their herding co-ops – the reindeer, not so much the jockeys. I remember reading somewhere that the ideal weight for a reindeer jockey is 60kg. You can do what you like with this piece of information. But the most obvious career for a reindeer is within the food industry. Having the choice you definitely want to aim to be a so called “live reindeer”. They get to live and breed. The alternative is less attractive. Reindeer meat has a strong gamy taste and may not be to everyone’s liking, but it still is a very popular meat all over the country. The most popular way of cooking reindeer is sautéing thin slices in butter, with or without onion and simmering it in stock or beer until its tender. The authentic accompaniment to the meat is buttery and creamy mashed potato and lingonberry jam, but you can also serve it with pasta or rice and replace the lingonberries with cranberries. This dish is widely available in restaurants all over Finland, not just in Lapland, and the meat can be bought from the freezer in most supermarkets. Some recipes don’t call for the meat to be cooked for long at all, but I simmer it for up to two hours to make it really tender. It is very thinly sliced so technically it’s done quickly, but particularly the meat you get from the supermarkets down south is not cut from the most tender parts so patient simmering will bring the best out of this tasty and wholesome dish. Melt butter in a lidded pan. Add the reindeer meat, chopped onion and minced garlic. You can add the meat frozen if you like. Saute until meat is brown and onions soft. Season with salt and pepper, pour a cup of water or beer on top. Cover and simmer for 1½ -2 hours adding water if necessary until the meat is tender. I served it this time with a potato and broccoli mash with cheese.